ASUS PCE-N13 PCI wireless adapter supports latest 802.11n wireless standard that allows you to connect to wireless N router, so that you could enjoy wireless date transfer bandwidth up to 300Mbps. The incredible speed of 802.11n makes it suitable for media-centric applications like streaming video or audio, Voice over IP conferencing, media file sharing and gives you capability to run multiple media-intense data streams through the network at the same time. This wireless adapter also works with PSP Xlink Kai and makes you easier to play game with worldwide PSP player over the internet. ASUS PCE-N13 works great with wireless router or access point that supports 802.11g and 802.11b, but when both ends of the wireless link work with 802.11n, the throughput would be increased even more. By having this handy ASUS PCE-N13 wireless adapter, you could connect to wireless network easily! If you are interested, find out more about this wireless adapter here. There isn't much to say about a wireless adapter except that it works or it doesn't. This one works well. It is fast and the board and antennae seem to be well constructed. I installed it on a system running 64-bit Windows. The Windows driver would not work with it at all and, in the beginning, neither would the ASUS driver. Device manager found the card but the network could not find it. After a bit of googling, I shut down my Kaspersky firewall and reinstalled the ASUS driver. It started and ran perfectly. I reactivated the firewall and it continued to work properly. I'm not a computer guru so I cannot explain why this would be. However, if you have trouble getting the card to work, try disabling your firewall software. What makes this little card so valuable is how compatible it is. ASUS is known for making motherboards and many HP's & Dell's use them for their motherboards. Normally when you buy a 3rd party hardware, you run the risk of it not working as well with your system. This is not the case with ASUS as chances are your motherboard is made by them or uses their chips. It is worth noting that this is a STANDARD Wireless N Card (PCI Express). This means if you have a dual-band (double band) router it will still connect, but you will not get that extra "Boost". Most people use that boost for gaming and if do not see yourself using your PC for gaming, then this will not be a problem. Although it is listed as N (Draft), which was the pre-release of the N standard... This card really is N standard. ASUS released it using the standard, about 2-3 months before it was officially labeled standard. So you really are getting a TRUE N Card on a budget. This card is simply okay at best. I bought it so I wouldn't have Ethernet wires running through my living room and kitchen. The signal is some what strong, average of 4 bar at about 20 feet away and through a couple of walls, though i thought it would be even better. This is my first pci wireless card so I can't really compare it with others but I can compare it with the wireless connectivity of other laptops. IMO laptop wireless card definitely outperform this one. My speeds are going always up and down for no apparent reason. And sometimes just browsing the web feels like it's taking much longer then it should be. I'm thinking of just leaving the wires because having a wired connection is 3x then when I'm connected through this card. Overall it's an okay card and does what it's suppose to, I would recommend it if you just Need something that gets the job done or if your looking for something cheap. 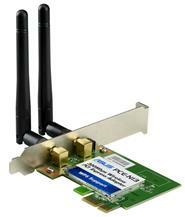 I bought this after I couldn't connect directly to my router, and it gave me a better connection than the last card I tried, a Wireless-G PCI model from Linksys. I haven't tried the utility to make a hotspot, and I didn't even install drivers. Windows 7 found and installed what was necessary, and I'm connected again. I can play mostly lag-free video games, and streaming video from my server connected to the router works as well, even with higher-bitrate files. Some tips: Avoid installing the driver from the provided disc, go to the website and get it there. Also try to avoid using any bundled utilities that take over from Windows Wireless Manager, as they are completely unnecessary, and you can run into problems. If you run into connectivity issues in your home, find out if any bulky objects are located between the connection points. Things like fireplaces, chimneys, concrete walls, and even appliances like microwave ovens and fridges can affect your signal strength. I installed this on a new Dell Inspiron 570. It's has an AMD processor with Windows 7. Windows found and installed the adapter upon starting the computer. There was no need to load drivers from the included disk. It works perfectly. Return to top of "ASUS PCE-N13 Wireless-N PCI-Express Adapter"! !